Excel Plus Workstations are used in the laboratory for the most demanding power handling applications, such as high accuracy weighing, processing of pellets, capsules and tablets and for dispensing of potentionally toxic powerdered compounds. The safechange cabinet in the Excel Plus range has been designed to provide the safest possible operation for both the user and maintenace staff. Development and performance testing has been undertaken with the support of a leading pharmaceutical R&D company. 'True Safechange Technology' eliminates the possibility of contamination either in the laboratory or upstream in ductwork and fan assembly. 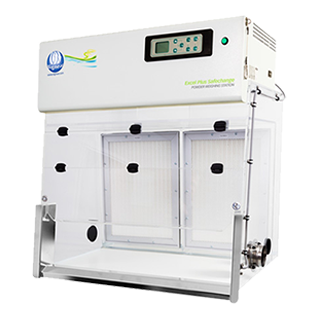 Double layer filtration provides extra filter system integrity. Double hinged front visors can be opened for full access to the cabinet interior. Fan speed auto-increases to maintain working face velocity. Gentle non-turbulent flow prevents balance fluctuation and cabinet dead spots. Five position balance gives stable and repeatable results. Angled clear front visors provide excellent vision of enclosed manipulators and comfort during use. 180mm height access across full cabinet width. Black work surface makes spillages visible.